Severe drought hits the Midwestern and Southern Plains. As the crops die, the “black blizzards” begin. Dust from the over-plowed and over-grazed land begins to blow. The number of dust storms is increasing. Fourteen are reported this year; next year there will be 38. When Franklin Roosevelt takes office, the country is in desperate straits. He will take quick steps to declare a four-day bank holiday, during which time Congress will come up with the Emergency Banking Act of 1933, which stabilizes the banking industry and restores people’s faith in the banking system by putting the federal government behind it. The Emergency Farm Mortgage Act allots $200 million for refinancing mortgages to help farmers facing foreclosure. The Farm Credit Act of 1933 establishes a local bank and sets up local credit associations. The Civilian Conservation Corps opens the first soil erosion control camp in Clayton County, Alabama. By September there will be 161 soil erosion camps. Over 6 million young pigs are slaughtered to stabilize prices. With most of the meat going to waste, public outcry will lead to the creation, in October, of the Federal Surplus Relief Corporation. The FSRC will divert agricultural commodities to relief organizations. Apples, beans, canned beef, flour and pork products will be distributed through local relief channels. Cotton goods are eventually included to clothe the needy as well. In California’s San Joaquin Valley, where many farmers fleeing the plains have gone seeking migrant farm work, the largest agricultural strike in America’s history begins. More than 18,000 cotton workers with the Cannery and Agricultural Workers Industrial Union (CAWIU ) strike for 24 days. During the strike, two men and one woman are killed and hundreds injured. In the settlement, the union is recognized by growers, and workers are given a 25 percent raise. Great dust storms spread from the Dust Bowl area. The drought is the worst ever in U.S. history, covering more than 75 percent of the country and affecting 27 states severely. Roosevelt signs the Taylor Grazing Act, which allows him to take up to 140 million acres of federally-owned land out of the public domain and establish grazing districts that will be carefully monitored. One of many New Deal efforts to heal the damage done to the land by overuse, the program is able to arrest the deteriorationsc but cannot undo the damage that has already been done. This same day, the Frazier-Lemke Farm Bankruptcy Act is approved. This act restricts the ability of banks to dispossess farmers in times of distress. Originally effective until 1938, the act will be renewed four times until 1947, when it will expire. 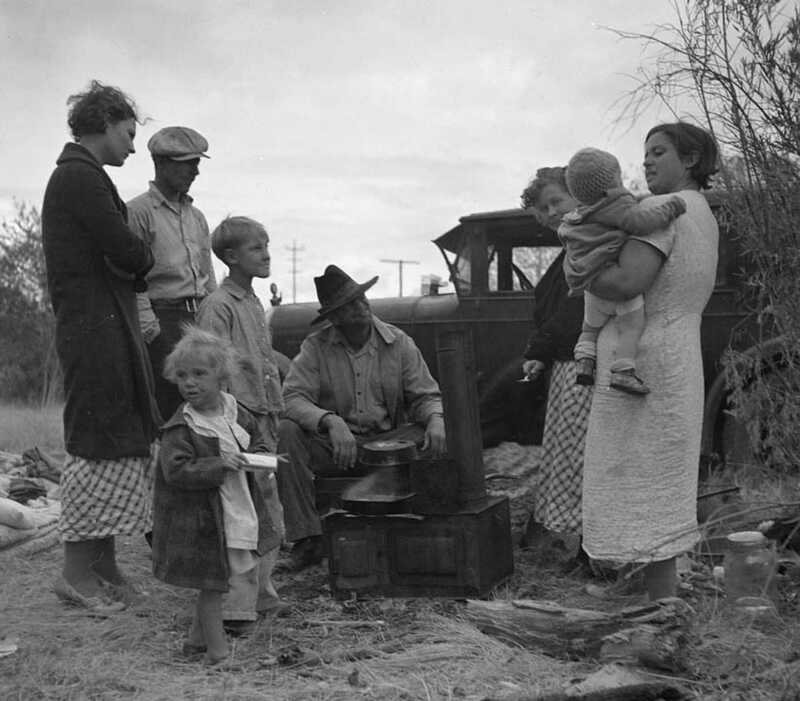 FDR approves the Emergency Relief Appropriation Act, which provides $525 million for drought relief, and authorizes creation of the Works Progress Administration, which will employ 8.5 million people. Black Sunday. 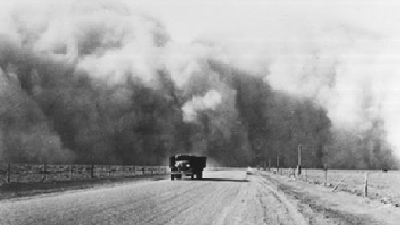 The worst “black blizzard” of the Dust Bowl occurs, causing extensive damage. 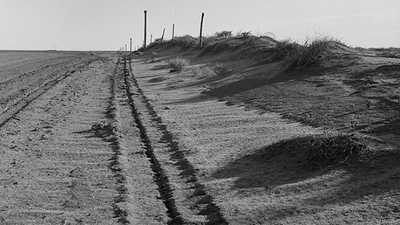 Congress declares soil erosion “a national menace” in an act establishing the Soil Conservation Service in the Department of Agriculture (formerly the Soil Erosion Service in the U.S. Department of Interior). Under the direction of Hugh H. Bennett, the SCS will develop extensive conservation programs that retain topsoil and prevent irreparable damage to the land. Farming techniques such as strip cropping, terracing, crop rotation, contour plowing, and cover crops are advocated. Farmers are paid to practice soil-conserving farming techniques. At a meeting in Pueblo, Colorado, experts estimate that 850,000,000 tons of topsoil has blown off the Southern Plains during the course of the year, and that if the drought continues, the total area affected would increase from 4,350,000 acres to 5,350,000 acres by the spring of 1936. C.H. Wilson of the Resettlement Administration proposes buying up 2,250,000 acres and retiring it from cultivation. Los Angeles Police Chief James E. Davis sends 125 policemen to patrol the borders of Arizona and Oregon to keep “undesirables” out. As a result, the American Civil Liberties Union sues the city. The SCS publishes a soil conservation district law, which, if passed by the states, would allow farmers to set up their own districts to enforce soil conservation practices for five-year periods. One of the few grassroots organizations set up by the New Deal still in operation today, the soil conservation district program recognized that new farming methods needed to be accepted and enforced by the farmers on the land rather than bureaucrats in Washington. FDR’s Shelterbelt Project begins. The project calls for large-scale planting of trees across the Great Plains, stretching in a 100-mile wide zone from Canada to northern Texas, to protect the land from erosion. Native trees, such as red cedar and green ash, are planted along fence rows separating properties, and farmers and workers from the Civilian Conservation Corps are paid to plant and cultivate them. The project is estimated to cost 75 million dollars over a period of 12 years. 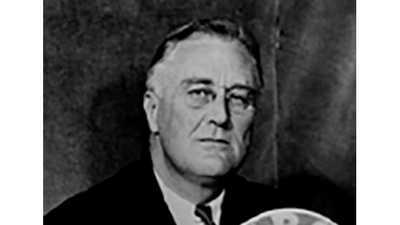 When disputes arise over funding sources (the project was considered to be a long-term strategy, and therefore ineligible for emergency relief funds), FDR transfers the program to the WPA , where the project had limited success. The extensive work re-plowing the land into furrows, planting trees in shelterbelts, and other conservation methods has resulted in a 65 percent reduction in the amount of soil blowing. However, the drought continues. In the fall, the rain comes, finally bringing an end to the drought. During the next few years, with the coming of World War II, the country is pulled out of the Depression and the plains once again become golden with wheat.